The first image of AMD's upcoming Socket AM4, the new single platform for its Bristol Ridge and Zen CPU and APU products, has been leaked, revealing a pin-grid array (PGA) design with 1,331 pin contacts. Officially unveiled earlier this month, AMD's AM4 represents a new direction for the company: where it had previously split its enthusiast-targeted FX central processing unit (CPU) products onto the AM3+ platform and its mainstream- and value-oriented A-Series accelerated processing unit (APU) parts onto the FM2+ platform, its next-generation CPUs and APUs will share the AM4 platform. The company also promised that both the socket and the chipset used for AM4 would be forwards-compatible, allowing those who buy Bristol Ridge based APU systems at launch to easily upgrade to the more powerful Zen-based Summit Ridge parts when available. While AMD has been quick to detail the technical prowess of the platform - including the promise of DDR4 memory support, PCI Express Gen. 3.0, USB 3.1 Gen. 2, Non-Volatile Memory Express (NVMe) and SATA Express - it has been quieter on the mechanical design. An image provided to HWSW, however, has provided the public with its first glimpse of the AM4 socket - and it's something of a beast. Compared to the previous AM3+, the AM4 socket boasts a 41 percent increase in pin count at 1,331 pin contacts - the first time a pin-grid array (PGA) zero-insertion force (ZIF) socket has featured so many pins. While processors from rival Intel boast a higher contact count, the company has long abandoned the PGA format in favour of a land grid array (LGA) design that moves the pins from the processor to the socket. AMD's use of the PGA format is, then, something of a throwback to a bygone era, though it brings with it some advantages: LGA sockets are notorious for having the pins bent by incautious handling or processor installation, something which is harder to achieve - though by no means impossible, as anyone who has dropped a PGA processor can attest - with a PGA layout. 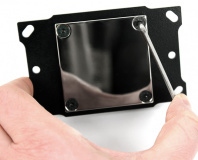 The AM4 image also reveals a design which will require new mounting hardware for coolers, something which has been known since announcements in June from manufacturers that AM4-compatible upgrade kits for existing coolers would be made available.